INFORMAS (International Network for Food and Obesity / Non-communicable Diseases (NCDs) Research, Monitoring and Action Support) is a global network of public-interest organisations and researchers that aims to monitor, benchmark and support public and private sector actions to increase healthy food environments and reduce obesity and NCDs and their related inequalities. INFORMAS supports the WHO’s Global Action Plan for the Prevention and Control of Non-Communicable Diseases (2013-2020) and the World Cancer Research Fund International NOURISHING framework. Who is involved in INFORMAS? The management structure of the network consists of an over-arching Secretariat, Council and an advisory group, as well as data collection, data management and knowledge exchange components. This Council consists of module leaders, participating country representatives, food policy experts and Secretariat representatives. The INFORMAS Council makes the policy, budget and strategic decisions. 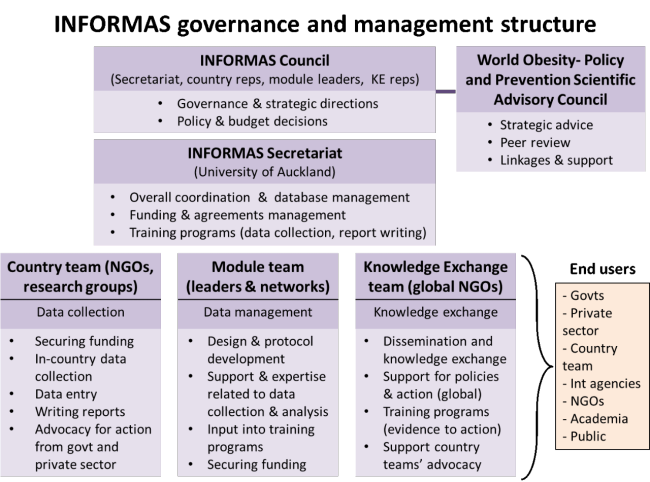 The World Obesity Federation (WOF) – Policy and Prevention (formerly The International Obesity Taskforce (IOTF) Scientific Advisory Council) serves as an advisory board to INFORMAS, providing peer review, linkages, support, and strategic advice. The Secretariat provides overall coordination, including central collation and management of data from the various modules. The Secretariat, in conjunction with collaborative groups in INFORMAS, is conducting data analyses and publication of reports, league tables, and journal articles. The Secretariat is hosted by the University of Auckland. Consists of NGOs and research groups within a country who are participating in INFORMAS. Country teams collate existing country-level data (if available) and collect new country-level data related to each module. These data will be used within that country as well as being submitted and stored in a central, global database. Module Leaders are responsible for the coordination of monitoring activities for each of the modules of INFORMAS. The research group managing each module develops standardised protocols for data collection, coordinates the data collection processes, and oversees the data management related to that module. Led by WOF and consists of several large, global public-interest NGOs (including Consumers International, World Cancer Research Fund, and National Heart Forum). It will be responsible for external communication and advocacy support for INFORMAS. This will include communications of findings, raising the awareness of publications, individual country feedback and stimulating advocacy groups. Use the results to strengthen public health efforts, particularly by supporting the translation of relevant evidence into public and private sector actions. INFORMAS is a global network of public-interest organisations and researchers and relies on external funding to support its projects. Anyone who is interested can get involved in INFORMAS, however, we cannot fund research projects. We are happy to assist in grant writing if there are funding opportunities where the INFORMAS team can help. Please contact us for further information. Twenty-two countries are actively doing food environment surveys of at least one of the INFORMAS modules. We would like to link with researchers in any countries who want to measure food policies and environments. We are also happy to assist in grant writing if there are funding opportunities where the INFORMAS team can help. Please contact us for further information.